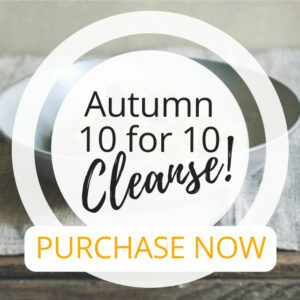 AUTUMN CLEANSE – A Special 10 for 10! Would you like to feel clear, balanced, renewed, vibrant in mind and light in body while enjoying the natural sumptuousness of this season’s soups, stews, broths, and other warm delights… with delicious recipes, a meal plan, Ayurvedic wisdom and tips ~ all for just $10? When the seasons change it is an important time to bring renewed awareness to our daily food habits. During these transitions, as with all the transitions of our lives, our systems become more vulnerable, potentially weakening immune function, and making us susceptible to colds, flu, or simply feeling run down. Now is the time to reset with an easy-to-digest, light but hearty, warming whole food cleanse that helps boost your immune system, improve digestion, enhance energy and clarity, while restoring calm and confidence. 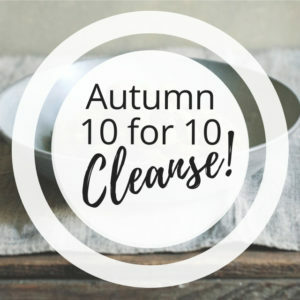 This 10 for 10 Cleanse gives you ten unique recipes perfect for an Autumn cleanse and a seasonal reset. The meals are delicious, hearty, and simple to make, with ingredients easy to source – all inspired Ayurveda’s genius for whole body wellness. This 10 for 10 Autumn Cleanse also includes a meal plan, which you can adapt to a 3-day, 5-day or week-long cleanse, plus suggestions and recipes for teas and tonics. Most importantly you learn Ayurveda’s wisdom for the season, so you can reset and re-balance every Autumn and meet life with clarity, grace and energy. This detox is plant powered, and is gluten-free, dairy-free, sugar-free, with an anti-inflammatory profile. The recipes give you light, but hearty meals, easy enough to incorporate into your daily rhythms. The Cleanse is potent, but gentle, so you can stay present to your day-to-day activities, although the best practice when cleansing is to rest as often as you can. Your 10 for 10 will be emailed to you as soon as you signup. Once you register, you will receive a confirmation email, followed by a few motivating emails over the week with tips for deepening the cleanse and maintaining optimal balance every day. We have dynamic All Season Facebook group where you can get support, ask questions, and even post your inspiration. I invite you to register now, for only $10, and give yourself the love of delicious, hearty nourishment. 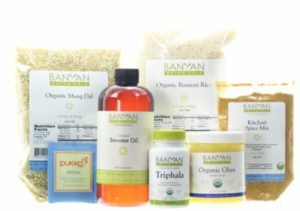 The easiest way to get the basic essentials of an Ayurvedic cleanse is to have then shipped straight to your door. Most of these ingredients are specialty and, depending on your location, may be hard to find. If you order now, they will arrive within a few days. On the other hand, sesame oil, triphala and pukka tea are supplemental to the Cleanse, while ghee can be replaced with coconut oil for Vegans. Thank you so much for this cleanse – it was so THOROUGH!!! If you are interested in a cleanse, Laura Plumb is doing a pay-what-you-can guided, on-line and phone-in, one-week cleanse this month, July 25 – 31st. I did a pretty bad job with her spring cleanse, running at about a 60% adherence, and I felt better than I have in years. The food is delicious. Ayurvedic (that’s the medical and nutritional sister to yoga.) Vegan. Self-nurturing. Not expensive. Not starving. Not weird or gross or hugely time-consuming (time is where I had to cut corners, but still felt benefits.) I kept up with a lot of her ideas — mostly the delicious ones. I’m doing it again, shooting for 70%! The last couple of days a few people have been asking me, what have I been doing, because I’m looking good lately. I’m not trying to be overly vain or anything, but MY, I have been starting to radiate more and look younger. I think all these MIRACLE Gifts Laura has been guiding us all in are A MIRACLE! I see people all around me not knowing that we all have the opportunity to REALLY change our lives for MUCH better, even beyond ways that maybe we never even thought of! Everything is sooooo good! Today I had so much energy and I’ve already lost about 3 pounds! I don’t feel hungry all the time, and I feel very satisfied. Love it!!! Spent a beautiful part of the day in the kitchen and loved every wonderful smell, color, & taste…..I am noticing with my senses so much more…especially with trying all these new spices…I am in heaven! I am forever grateful to you, Laura, for the GI cure!!!!! Get this simple Ayurvedic Cleanse now. I look forward to enjoying seasonal wellness with you! * You don’t have to know anything about Navratri to do this Cleanse. It is only an inspiration, although the Navratri in its origins was entirely Ayurvedic – seasonal transitions are an important time to observe our tendencies and improve our daily habits, otherwise we are vulnerable to dramatic weather changes that can adversely affect our health. This is what this Navratri Cleanse means to me: it is a time to clean up, clear out, rest deep and reset new intentions for the new seasons to come. If you are interested in learning more, Sadhguru of the Isha Foundation has a good overview here.